On a flight to Houston this past Friday, I noticed that Southwest Airlines has changed their position on passenger use of GPS receivers during flight. It seems they are no longer acceptable at any time. Now this is something I’ve been watching for a while. American Airlines had them on the “banned” list, but Southwest (until recently) had them on the “allowed” list. So I assumed it was not an issue of FAA rules but rather the choice of each airline. Turns out that I was right. Southwest Airlines officially changed their position on GPS receivers in May of 2007. American Airlines has not allowed them since July of 2000. So why was it safe for Southwest, but not for American? FUD. The folks over at the PunditGuy blog seem to think allowing passengers to use a GPS is a huge security risk. They specifically reference using a GPS for a “… non-cockpit-centric downing of an aircraft in a strategic location.” Clearly the American Airlines ban did little to stop the attackers on 9/11 (who used GPS devices to navigate to targets). And even if attackers had not used brought a GPS, the plane’s cockpit is equipped with one anyway. As an aside, PunditGuy also thinks Southwest’s lack of assignned seating is a security risk. Did knowing which seats the hijackers were in on 9/11 save any of the innocent who died that day? No. The important thing was having a passenger manifest. PunditGuy’s logic here is that one crazy passenger could use their GPS to wait for that “perfect moment” and then open one of the emergency exits. That just won’t work in flight. A pressurized fuselage and physics make it impossible. If you agree with me, be sure to tell Southwest how you feel. I enjoy using my GPS on flights. I won’t break the rules, but I certainly will lobby to have the rules changed back. And while you are at it – tell Southwest how much we all like their open seating policy. It is a staple that defines Southwest and sets them apart from everyone else. Now that I have run Apple BootCamp on my Mac for a while, I decided it was time to try something new. 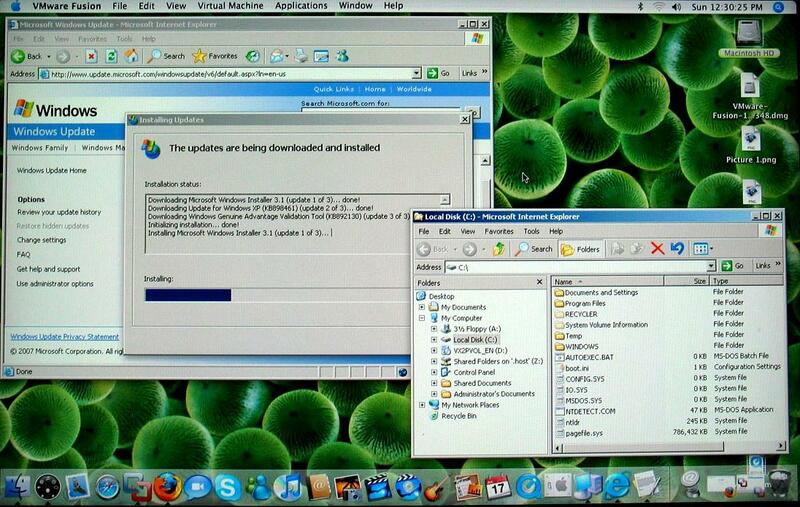 BootCamp had great driver support for running Windows XP on a Mac, but I was tired of rebooting to get back and forth. So virtualization would be my solution. I had already tried Paralells on a friend’s iMac and had a pretty good idea what that was all about. So I bought a copy of VMWare Fusion for my Mac. The first mistake I made was deleting BootCamp before I installed Fusion. Did you know that Fusion can take your existing BootCamp partition and turn it into a VM? I clearly didn’t (but I probably should have – VMWare has great PTV tools). So I’m loading XP SP2 as a VM right now. Fusion supports much more than just XP. They can do Windows 3.1, 95, 98, Me, NT, 2000, XP, 2003, Vista, and Longhorn. But they do more than Windows. They can do Linux including: Red Hat, SUSE, Novell, Mandrake, Ubuntu, and many others. And as if that wasn’t enough, they support the VMWare Appliance Marketplace as well. I’m sure I will have a LAMP appliance up and going just as soon as I finish downloading it. You may have noticed that I added a banner in the upper right part of the blog supporting Mitt Romney for President. I never intended to turn this into a political blog, and I’m not starting now. However, I’ve never been afraid to share my views and opinions. I would encourage you to check out what he, and all the other candidates, have to say. Then make up your own mind and support your candidate. One thing Mitt and I agree on is unwaivering support for our troops serving in war zones. No matter how you feel about the various military actions the US is engaged in, we (as citizens) need to recognize the dedication and sacrifice being made by these young men and women on our behalf. Take just a few minutes today and decide how you want to show your support. I chose to donate 10 USO care packages, but there are many other ways to give of your time and talents. Take a look at Mitt’s “Join the Surge of Support” page for other ideas. This is a great entry to post your comments. I’d love to hear what individuals and communities are doing to show their support.